I'm running a 15/41 set up too. Installed a longer gold DID chain. I'm using a PBR brand rear sprocket which I purchased locally. PBR sprockets are made in Italy. Thank God there is a local distributor here. Good quality sprockets!!! Anyways, I do a lot of track time and usually take my bike out on sunday blasts on nice twisties roads with my riding buddies. I am planning on going 42T on the rear and do away with the 41T. Though, the 41T rear has improved my low down quirkyness and improved my mid all the way to a good top end pull...very happy with this present set-up!! I plan to go one tooth up...42T this time as our racetracks here seem to be more suited for a 42T rear sprocket ratio gearing. Since I have gone up from a 39T to a 41T = from a 104 link stock chain to a new 106 link gold chain...DO I HAVE TO REPLACE MY CHAIN AGAIN GOING UP 1 TOOTH MORE FROM 41T TO A 42T? Hi Migs and fellow 1199ers, would you have any thoughts if i shortcut the gearing change and just go down 1 tooth in front to 14T instead of changing chain and rear sprocket? Numerous post and in this thread also relating to the 14 tooth front, cheaper option as only need sprocket, use original chain, I have done it and it pulls real hard now, if you can afford a new chain etc go the larger rear and bling the hell out of it with a quick change hub etc. Got my 41T setup with some bling last Sat. and went for a 250mi ride Sun. I loved it! Lost that dead spot hesitation at low RPM's and was smooth sailing with extra giddy up. Cant wait to try it out on the track. 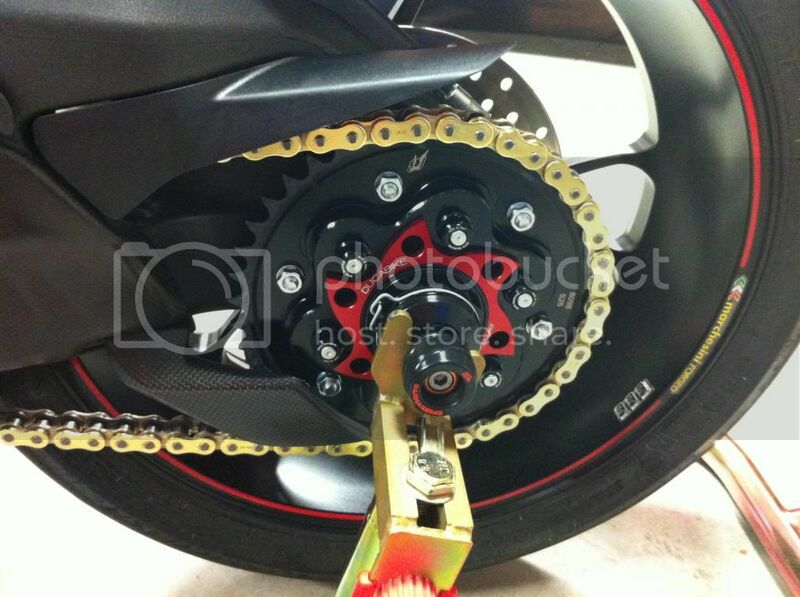 Could you please let me know all the parts you have installed as sprocket, chain, sprocket carrier, etc... I like to my bike looks like yours. Thanks a lot! and if you can the website pages to purchase those items. Last edited by zx7md; Apr 16th 2014 at 09:47 AM.